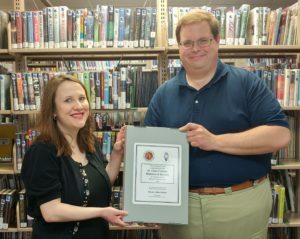 William P. Shannon IV, Curator at the St. Clair County Historical Society visited the Smithton Public Library on Friday, April 13 to present Library Director Jenna Dauer with a copy of the book “History of St. Clair County,” published in 1881. This gift celebrates Illinois’s Bicentennial and National Library Week. The library would like to thank Pete and Colleen Hensel for their generous donation. Please contact the library at 618-233-8057 if you have issues with the links above.